Today, the Rhode Island Commemorative Silver Half Dollar Coin remembers the debates in the House of Representatives on January 11, 1872 regarding the statue of Roger Williams. In 1865, Congress sent invitations to each of the states requesting they send two statues of distinguished men to represent them in the National Statuary Hall. The small state of Rhode Island became the first to send the statues, one of Nathanael Greene and another of Roger Williams. The Senate approved and accepted the Roger Williams statue on January 9 and the House of Representatives debated the subject on January 11. A civilized but spirited debate occurred between the representatives of Rhode Island and the representatives of Massachusetts. The Massachusetts contingent did not like being reminded that the early Puritans were intolerant regarding religions other than their own. As a result, one of the representatives from New York, Samuel S. Cox, added his opinion of the symbolism of the statue, not only in representing Rhode Island but also remembering the nation’s religious freedom. Mr. Speaker, I am reluctant to intrude upon these funereal ceremonies enacted two hundred years after the burial of Roger Williams; but, after what we have heard on matters connected with esthetics, history, religious toleration, and “soul liberty,’’ I undertake to say that Roger Williams will never suffer by discussion in this House from the State of Massachusetts, or in this age of enlightenment. We are all, Mr. Speaker, under obligation to Roger Williams, though it extends back nearly two centuries. I am ashamed to say that the State of Rhode Island, where I was educated, has never yet erected a monument to his memory, or even discovered the place of his sepulture. It does not much matter, as his soul is not located. Someone has said that an apple-seed planted in the ground struck into his skull, and has produced fruit. It has so, for many generations. Under the shadow of that apple-tree, men can sit down as under the old vine and fig-tree of the Scriptures, with none to molest or make afraid, so far as God and religious connection are concerned. He was received by the Indians with kindly welcome. Hence the name of the rock. He was a true, good, and tolerant Christian gentleman. The colony of Massachusetts, which cast him out, could not appreciate such a soul at that time; nor have they since, though Mr. Bancroft gives him an immortality as one of the heroes of our star. Roger Williams went into the wilderness. The very savages received him after he had been exorcised, as a bad spirit, by that puritanical element so lauded here today at his expense; the same spirit which left England to escape sacrifice and disasters. Nor did the Puritans come to this country, as has been said, to leave their mother Church of England. Without leaving their church at all they went to Holland. There they became so troublesome and pestiferous that the Dutch shipped them to some unknown country. It was shrewdly suspected and is generally believed that it was intended to land them on the island which I have the honor, in part, to represent; but by some dispensation of Providence, or a trade or bribe with the skipper, they did not land there, but at Plymouth. The Puritans made a system of government which has been much praised. But, as I could show from history, it does not contain one element of democratic, religious, or civil liberty. It struck down the capital thought of civil liberty. It throttled Roger Williams by exiling soul liberty. This is proved by the elegant and truthful speech of the gentleman from Rhode Island. All history confirms it. My reason for voting to receive this statue from Rhode Island is that Roger Williams was the champion of that which was then too great and generous for Massachusetts to accept; but which the American Republic in 1787–ay, all nations now—including Spain and Italy, receive as the organic law of the relation between God and His creatures. In America we are not without illustrations of religious liberty. Lord Baltimore illustrated it in Maryland, as Roger Williams, almost contemporary, illustrated it in Rhode Island. But if you will search history for truth, you will find that these Pilgrim fathers, so prodigally lauded, when they were about to come to this country went to King James and applied for a charter. But, Mr. Speaker, I did not expect to participate in this debate. I had no right perhaps to enter into the discussion, except for this one reason: I belong to the little State of Rhode Island. Perhaps, by my size, I belong to that little State which Major Noah once said he could put in his breeches pocket, and which I believe is entitled almost to one representative under the recent apportionment—“two.” some gentleman says. I shall be satisfied with one—Roger Williams! But whether one or two, she is a sovereign State; and most sovereign in the ideas of Roger Williams! I am especially a friend of Rhode Island because, as a boy, I was drawn thither to her splendid and liberal college, Brown University, and to the grand presence of that truly noble man, a fit successor of Roger Williams, Dr. Wayland. He was the demi-god of our era. Under his tuition I spent the happiest of my days. The chief delight of my life is that I was educated by his great and generous soul; and in a college, the first clause in the charter of which was that there should be perfect religious liberty to Protestant and Catholic, to Jew and Gentile, to paynim and infidel—all alike. This is the distinguishing characteristic of Rhode Island. The principle of religious liberty, or as Roger Williams himself called it, of “soul liberty,’’ is illustrated in the charter of the college of Rhode Island. In Massachusetts they made their laws to conform to the law of God; but the Puritan people and the Puritan Church were the Aarons always to interpret those laws. The Puritan adopted a similar mode. I am sure there has been improvement in recent times. There has been great advance in Massachusetts since Roger Williams went into the wilderness. I have seen the day, and I am not old, when a Baptist, an Episcopalian, a Separatist, Quaker, or a Desenter, would have stood in fear of being hung, if not in Washington, on Boston Common, [laughter; ] but I do not believe at this day that any man in this House would wish to revive the relentless, terrible, and horrible agonies through which the better men of our colonies passed two hundred years ago. We have passed all that; no thanks to the Puritan. There is to be no more tearing out of Quaker tongues, no more death of supposititious witches, no exile of Baptists. We have fixed it as a part of the Constitution, not religious liberty for this one or that one, but complete religious or “soul liberty,’’ for all, not the mere toleration; not the writ of habeas corpus which you have altogether abrogated, not the liberty of print, speech, locomotion, or life, but the liberty in which each and every man exults, as a sentient being, when untrammeled, he lifts his soul in prayer to his Maker and his God. Therefore, I welcome this effigy of Roger Williams to the Capitol. It is a protest against intolerance and bigotry. It is an everlasting symbol of religious liberty, as fixed in our Constitution, by the practice and example of Roger Williams and Rhode Island. Let his form in marble ever reproduce in the mind the generous, logical, and noble truths of his life of sacrifice and devotion. 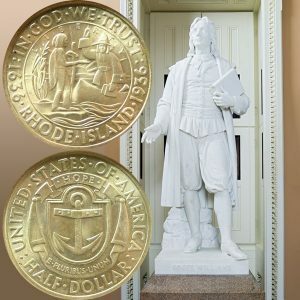 The Rhode Island Commemorative Silver Half Dollar Coin shows with an image of the Roger Williams statue in the National Statuary Hall.